AMDA | AMDA News - Teddy Toye Shoots (Hoops) for Broadway! Teddy Toye Shoots (Hoops) for Broadway! AMDA alum Teddy Toye (Summer 2009) has been on a roll since he graduated, booking national tours for Disney’s High School Musical and If You Give a Pig a Pancake, along with TV appearances on “One Life to Live,” “The View” and “Jerseylicious.” Currently playing the role of Harold in the celebrated new musical Lysistrata Jones, Teddy hits his stride and talks to us about how got this far so quickly. What was your experience like at AMDA? I had an amazing experience at AMDA! I was very fortune to have the teachers I did, like Mark Riherd, Elaine Petricoff, Ray Virta, Mark Santoro, Evan Pappas, Jay Dias and Igor Goldin. The combination of all of them really helped push me to new levels. They challenged me, which made me in turn want to try harder and prove to them that I could do it! Also having the school in the city really gave me the upper hand to jump start me into this industry. When I graduated from AMDA I walked away with an agent and the knowledge of what I have to do in an audition, and after, to book the job. You have managed to work steadily since your graduation in theatre, television and film. What can you tell us about how you have kept so busy? I’ve been very blessed and lucky to have worked so steadily, everything has just seemed to fall into the right place at the right time for me. After graduating AMDA, I saw an audition for the High School Musical Tour that Theatre of The Stars was producing. I figured, “what the heck, I’m a hip-hop dancer and I look young. I might as well go for it.” That tour gave me the chance to work with a lot of amazing people. After that experience, I booked a job on "One Life To Live" for about a month. It was another sort of High School Musical / "Glee" type of project with choreographer A.C. Ciulla (choreographer of Footloose on Broadway.) A.C. and I worked very well together and he loved my girlfriend (Ellenore Scott from Season 6 of “So You Think You Can Dance.”) We were fortunate that they continued to feature us in additional scenes on the show, and eventually we were asked to perform on "The View." Afterwards, A.C. helped me secure an agent for dance and commercials, allowing me the opportunity to work on music videos with people like Fat Joe. I also worked on a one-day shoot for the movie Dark Horse, choreographed by Dan Knechtges. That is what helped me to land Lysistrata Jones (a.k.a. basketball training) in the future. Basically every job I have booked has led me into the next one. Let’s talk about your current role as Harold in Lysistrata Jones. This is a new musical playing off-Broadway that has been getting incredible reviews and press. The NY Times called it "effervescent, tasty and surprisingly filling new musical," and the Hollywood Reporter called it“ a sassy new quasi-teen musical." What has this experience been like with all this attention? It has been unreal! I get to work with some of the biggest names on Broadway everyday, people like Jason Tam and Patti Murin. These are people, that when I was at AMDA, I looked up to and wanted to be like, and now I am working with them on stage and they're some of my closest friends! As for the creative team, Douglas Carter Beane and Dan Knectges have both been nominated for Tony awards and Lewis Flinn’s music is unbelievable. To be able to come to rehearsal everyday and have these people looking to create something with me, that is the most rewarding part. 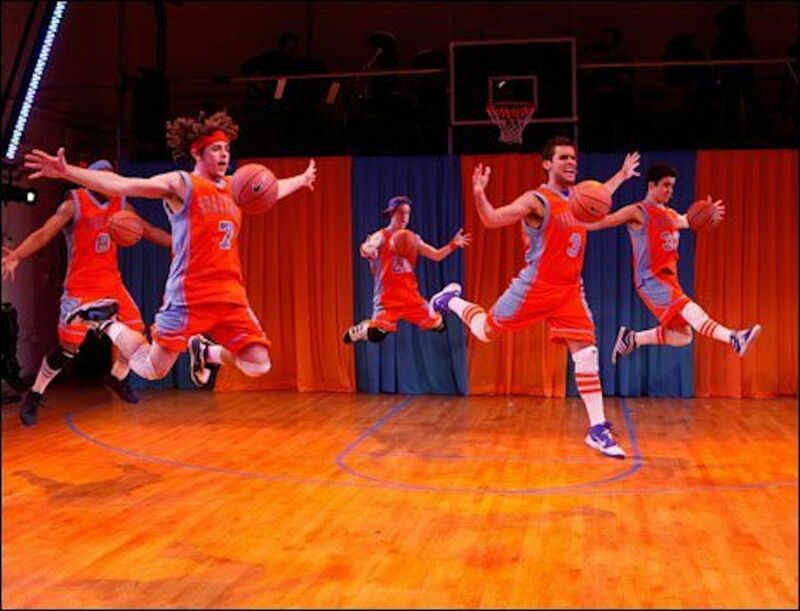 The most challenging aspect of this show was learning to incorporate the basketball while dancing choreography at the same time. It took us all quite a while to master that. I also have the honor of being the dance captain. I feel like it is really pushing me to be on my game. We actually had Tyllus, my love interest in the show, leave to go somewhere else. My job as dance captain was basically to teach the new actor the entire show. I had about a week to teach him all of the dances and blocking. It went amazingly well and I felt extremely accomplished after that. Another perk is all of the press and celebrities who have come to see the show. We've had Vanessa Williams, David Hyde Pierce, Penny Marshal, Jerry Zaks, and casting agents from Telsey and other high profile agencies. The exposure alone with this project has been unbelievable. Next I will be playing Otto/ Dance Captain for ReVision Theatre’s production of Spring Awakening, starting in August. What is your ultimate career dream and how do you see yourself achieving that in the future? My ultimate career dream is to originate a role on Broadway. I believe I am on my way to that, as they announced that Lysistrata Jones might be going to Broadway in the fall! Obviously actors don’t book every role they audition for, and sometimes it can take a while to start see things happen. What keeps you going? I just try and stay positive about every audition. If I don’t get it, I tell myself "I just don’t fit what they are looking for and it has nothing to do with my talent," which is true in most cases. Everything nowadays comes down to height, or look or what the writer of the show has envisioned the characters to look like in his head for the past 20 years. I try not to take it personally and just move on to the next knowing I'll fit someone’s mold eventually. Now that you have been out there working on stage and screen, what tips do you have for students and recent graduates of AMDA? The main thing I would try and remember is to be kind to everyone you work with. Most of the jobs I’ve booked have come from other jobs. Choreographers or directors have often rehired me because they loved working with me and being around me in a work environment. I hear stories all the time of actors who were awful to work with and they never want work with them again. I never want to be that person they are talking about. So be sure to give it everything you have when you are on a project whether it’s big or small. You just don’t know where else that project my lead you!